The OpenStreetMap Foundation has learned of the death of our friend and colleague, Ulf Möller. Ulf’s family have asked if we can help find Ulf’s killer(s)? Please see the photos of the murder suspects and help if you can. Ulf discovered OpenStreetMap in 2007 and mapped in Munich and Hamburg as well as in other countries. He was the first German elected to the OpenStreetMap Foundation Board in 2009/2010 and served on the License Working Group with attention to detail, concern for the German OpenStreetMap community and courteous persistence. The OpenStreetMap Foundation Board offers sincere condolences to Ulf’s family on behalf of the OpenStreetMap community. We are saddened and shocked by his untimely death. The family has requested privacy at this difficult time. Please use the comments in this post to share your memories of Ulf and condolences for the family. They will know where to find them when they are ready. 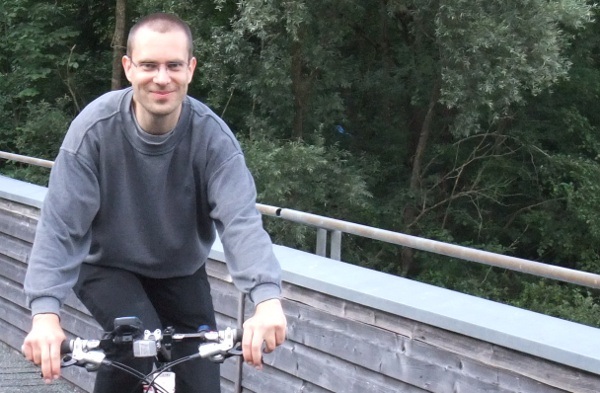 Ulf’s family has kindly provided the above photograph of Ulf as we will remember him; Smiling, happy, cycling, and apparently mapping with his GPS. This entry was posted in Board and tagged Memorial, Ulf Möller on January 18, 2012 by Richard Weait.